If you’re still new to machine quilting and piecing quilts, Quilt As-You-Go may be a great book to add to your collection or give as a gift this holiday season. Author Jera Brandvig’s friendly tone and easy-to-follow writing tone makes it easy to master the techniques taught in her book. Jera Bradvig is a best-selling author and the creator of the blog Quilting in the Rain. Quilt As-You-Go offers a romantic take on her quilts. The book includes nine projects in total, and 51 mix-and-match blocks. Jera also includes three joining methods, which are optional but great for quilt as-you-go lovers. One of the joining methods doesn’t require any additional quilting steps after the quilt has been assembled. In the introduction of the book, Jera explains that the methods she teaches can be applied to any block pattern. Jera leaves nothing to chance in this book. She provides a convenient list of supplies that you’ll need to work on the projects. 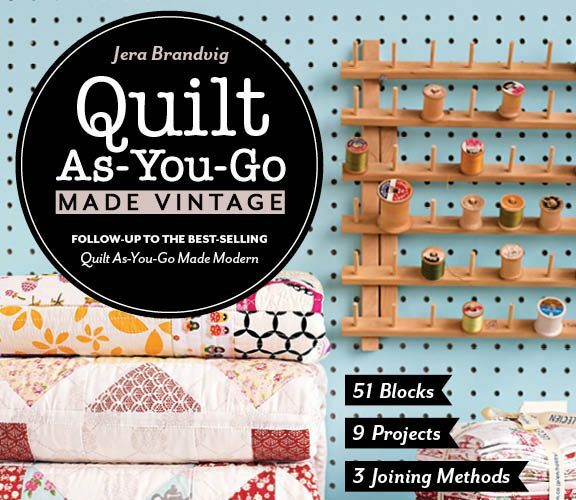 Even if you’re new to quilting, you’ll find the projects in this book to be easy to follow, and you’ll find that Jera’s writing style is really easy to follow. The projects included in the book have both modern and abstract designs. All of the patterns are easy to follow, so even beginners will be able to make a quilt using this book. And those techniques are very forgiving so that beginners can have an easy time getting through projects. If you’re a more advanced quilter, you may be wondering whether this book will teach you anything new. The answer is: yes. Even advanced quilters can learn new techniques and tips from this book. Jera explains that seasoned quilters can learn a fresh approach with her techniques. What we like about this book is that Jera’s methods break the rules, but she does it in a fun and creative way. The book includes big, beautiful photos that help walk you through the patterns and techniques. One thing I almost forgot to mention: She has an entire chapter dedicated to fabric choices. Jera’s encouraging tone gives quilters the courage to take chances and be bold with their quilting designs. Her passion for quilting and sewing is evident in her writing style and the way she explains her methods. The great thing about Jera’s techniques is that she teaches you how to set attainable goals for your project. Even if you have a busy schedule, you can manage to still work on projects and practice your patchworks. The goal is to work with small, manageable pieces so that you don’t feel overwhelmed or frustrated by the process. The book does include nine projects, but I would have loved to see more added. Perhaps it’s because I love her designs, or because her techniques make it easy to get a project done. Nine is still a generous number of projects. That being said, this is really just a minor – and very personal – complaint. Quilters of all skill levels love the Quilt As-You-Go book, and it’s easy to see why. Between the gorgeous color photos, easy-to-follow techniques and the generous number of fun projects, this book deserves a place on every quilter’s bookshelf. If you’re looking for a quilting book that offers easy-to-follow techniques, fun projects and a friendly writing tone, you will love Quilt As-You-Go. You’ll love breaking the rules and being creative. You’ll love creating vintage-style quilts. You’ll love Jera’s style and her easygoing way of explaining things. These techniques can be used to create large quilts if that’s what you’re going for. The joining methods are great to learn and will make your life easier. You’ll spend quite a bit of time going through this book – it has 144 pages. But you’ll enjoy every page that you turn. If you’re apprehensive about buying this book, don’t be. You’ll learn new tips and techniques that you can apply to any quilt design. 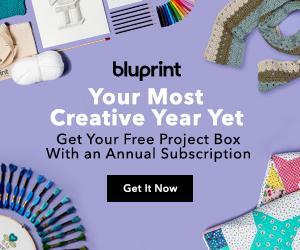 And you’ll create beautiful quilts that you’ll enjoy for years to come.